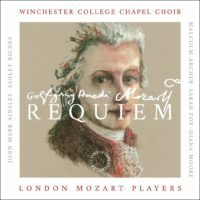 This new recording of Mozart’s Requiem (in the Süssmayr completion) on Convivium Records combines the young singers from Winchester College Chapel Choir with the London Mozart Players under the baton of Malcolm Archer, director of chapel music at Winchester College, plus a strong line up of soloists, soprano Sarah Fox, mezzo-soprano Diana Moore, tenor John Mark Ainsley and bass Ashley Riches. Overall, Malcolm Archer takes quite a traditional view of the work, this is the sort of medium sized chamber performance which used to be quite common on disc before period instruments. The choir is quite a decent size, with 16 trebles and 25 altos, tenors and basses; not quite all male, there is at least one female alto. They make fine lithe sound, with admirable control and not too treble dominated, though perhaps just occasionally the trebles tone hardens a touch in the upper reaches. The young tenors and basses give a remarkably strong and focussed sound. The orchestra balances this with 27 players, and the two basset horns cut through the texture in just the way they ought. Archer uses the Süssmayr completion, sensibly reckoning that there are some good things in it and it does after all date from Mozart’s time, but he does adjust some of the thicker scoring. His speeds are on the fast size, without ever feeling brisk. This has the advantage of keeping his choral forces moving lithely, and orchestral players follow admirably. You could probably choose a version with an adult professional choir if you wanted sheer perfection in the chorus, but here Winchester College Chapel Choir give and appealing, lively and fresh sounding account of the familiar music, coping with the technical demands admirably. Whilst his speeds are quite modern, Archer’s phrasing has a more shapely romantic sound to it, and he particularly encourages his choral singers to shape phrases in a way you do not always hear. The soloists are a strong bunch and make a finely characterful contribution. The four work well together, which is necessary in this work as there are few real solos and a great deal of semi-chorus type ensembles. Ashley Riches turns in an authoritative account of ‘Tuba mirum’ using his grainy bass voice to great effect. Sarah Fox is beautifully poised in her solo in the first movement, but there is a strong contrast between her warm, vibrato-led tone and that of the trebles. This is something that crops up in a few places, and applies to Diana Moore’s equally warm-toned mezzo. If this does not bother you, then the vocal quartet make a strong showing. John Mark Ainsley completes the four with a beautifully lithe account of the tenor solos, and we are going to regret his lack now that he has retired. If I said that this was an engaging, middle of the road account of Mozart’s Requiem, then that is not to decry it. Malcolm Archer and his forces have few axes to grind and no theories to prove, steering a neat course between period austerities and big-boned romanticism, and they really make a modern instrument performance work in a stylish manner. With a performance based around the young singers of Winchester College Chapel Choir, Archer and his forces make a strong showing.